TORONTO - Andrew Harris is Mike O'Shea's kind of player. 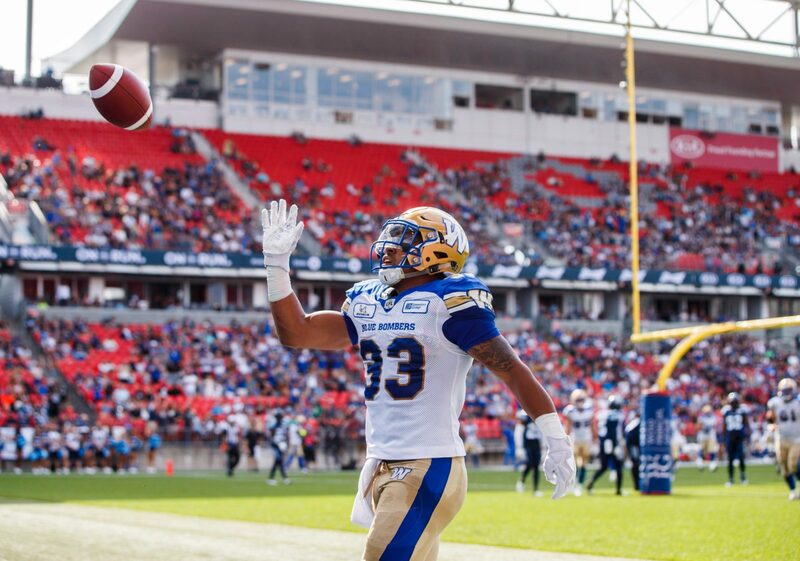 Harris ran for a career-high 161 yards and scored two TDs to lead the Winnipeg Blue Bombers past the Toronto Argonauts 38-20 on Saturday afternoon. It was the second career-best in as many weeks for Harris and his third straight 100-yard effort. "Man, I would've loved to play with him,'' said O'Shea, the Bombers head coach. "I would've been fired up on the sidelines all the time he got the ball, I would've begging the offensive coaches to just give it to Andrew. Heady praise, indeed, from a Canadian Football Hall of Famer and one of the most decorated Canadians in CFL history. O'Shea, 47, of North Bay, Ont., won three Grey Cups as a linebacker with the Toronto Argonauts and the league's '99 top Canadian award. O'Shea amassed 1,154 tackles over his illustrious playing career, tops among Canadian-born players and second all-time. He was later named an All-Time Argo and earned a fourth Grey Cup with the franchise as its special-teams coach in 2012. The five-foot-10, 211-pound Harris anchored Winnipeg's 184-yard rushing attack. 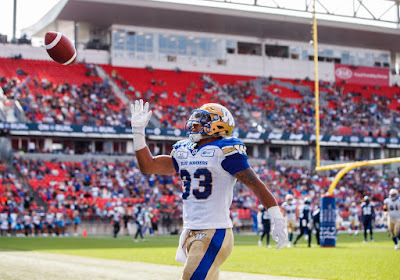 The Bombers came into the game averaging a CFL-high 171 rushing yards per contest. But Harris, a 31-year-old native of Winnipeg, couldn't forget about the fumble he lost late in the first half that allowed Toronto to kick a field goal and pull to within 25-12 at halftime. "It feels great but I think the biggest thing about this game is I'll be looking back on that fumble,'' he said. "Those five guys up front (offensive live) are doing an amazing job. Harris now has 6,878 career rushing yards, moving past Jon Cornish (6,844) for second all-time among Canadian-born players. The late Normie Kwong is tops with 9,022 yards. The contest drew a season-low 10,844 spectators at BMO Field. That comes after just 12,196 fans watched the defending Grey Cup champions dispatch Edmonton 20-17 on July 7. So through three home dates, Toronto is averaging just over 13,100 fans in its first year of ownership by Maple Leafs Sports & Entertainment. The Argos averaged under 14,000 spectators last season. Toronto visits Winnipeg next week at Investors Group Field. Winnipeg (3-3) earned the victory a week after blowing a 17-0 half-time advantage against B.C. and losing 20-17. The score flattered Toronto (1-4), which put up 19 points off three Bombers miscues. The Argos converted two fumble recoveries into 11 points to pull to within 25-12 at the half. Llevi Noel returned Kevin Fogg's punt-return fumble 49 yards for the TD at 14:11 of the second before James Franklin found Armanti Edwards for the two-point convert. Toronto's Cleyon Laing then recovered Harris's fumble at the Winnipeg 51 with 12 seconds left. That set up Ronnie Pfeffer's 31-yard field goal to end the half. Winnipeg countered in the third with Nichols' one-yard TD run at 4:15 and Justin Medock's 16-yard field goal at 8:58 for a 35-12 advantage. But Jermaine Gabriel returned Nic Demski's fumble 87 yards for the TD at 13:07. Franklin's two-point convert cut Winnipeg's lead to 35-20. "Sometimes a game like last week can be one that's a turning point in your season,'' Nichols said. "But I think we have veteran guys here who understood this was an urgency game for us and we came out and played like it in all three phases. Winnipeg registered 429 total offensive yards while holding Toronto to just 173. The Argos ran for just 22 yards on nine carries with James Wilder Jr. finishing with -2 yards on his three rushes. Toronto head coach Marc Trestman said outside of forcing turnovers, his team didn't do much on either side of the ball. "We had some light moments where we picked up a fumble and ran for a couple to touchdowns, but we didn't finish any drives offensively and didn't stop the run well enough. Franklin finished 21-of-36 passing for 151 yards and an interception and shouldered the blame for the loss. Darvin Adams had Winnipeg's other touchdown. Medlock had four converts, three field goals and a single. Pfeffer finished with single and field goal but also missed two attempts. I wonder if Bombers are planning the GC parade yet?